While Binney would never plumb the depths that demonised and caricatured men such as the missionary Henry Williams (a supposed land-grabber with substandard Māori language skills), she nevertheless went on to adjust the scales of history in a process that has led us to where we are today: where Te Kooti is no longer the murdering rascal with Ringatū – a mongrel version of an Old Testament religion – as his bequest, and Rua Kenana, rather than a failed prophet, is instead a powerful living figure in the renaissance and resistance of Tūhoe to the reclassifying of their homeland, from papatipu to National Park. 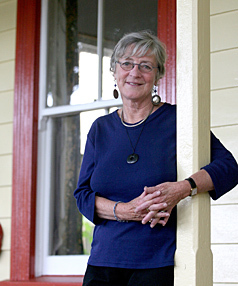 Whatever view one takes of these revisions, there is little doubt that as an historian Binney was a moralist, and ended her days as an activist on the side of Tūhoe claims to mana motuhake in the Urewera – ownership, not guardianship, or de facto kaitiakitanga of a merely decorative nature. She arrived at this point by moving out from the academy, reaching beyond primary textual sources such as letters and papers in public archives throughout the country, parliamentary reports and Māori newspapers, to the living words of Māori informants themselves: oral history that both supplemented and reinforced the written word, while yet questioning, contradicting, undermining and subverting received versions (as with Te Kooti and Rua Kenana, above). It is no accident that at the Ruātoki launch of her magnum opus, Encircled Lands: Te Urewera 1821–1921 (i) in 2010, in a pōwhiri at Rongokarae that included the full wero to a rangatira, as she carried the book onto the marae ātea, the iwi conferred upon her the honorary title, Te Tōmairangi o te Aroha (the heavenly dew of love). Both Māori Television and TV One covered the event, and in a segment of the latter’s Māori news programme, Te Karere, Dame Judith Binney’s welcome moved seamlessly into a visual history of Tūhoe’s struggles with past and present administrations, and the Crown. (ii) A subsequent YouTube presentation had this: ‘Tūhoe are very happy with the new book by Dame Judith Binney but hapū have concerns for treaty claims’. A certain line has been subtly crossed when history and political activism meet as they do here – which is not a criticism of Judith Binney’s stance, which I happen to share. But it is impossible to enter the Māori world as a Pākehā historian – finding oneself so moved as she is, and as I have been – and remain an objective and dispassionate observer, one who might not wish to be so entangled, on the grounds that historiography and political engagement are guests at different tables. Once they are found supping together, they are changed. What counts here is motive: what is the writer’s need to be in this area, what is in it for them, and not just present or future audiences, who may be more – or less – sympathetic to the approach taken by contemporary writers of our history. I fully expect her work to stand, but time will test all our motives, as it winnows the results: the writings of early to mid-twentieth century recorders of Māori history and culture – such as Elsdon Best – lionised in their time, much dismissed in Binney’s generation, are a case in point. In his once highly regarded single volume account of Māori life and culture, The Māori as he was, (iii) Best confidently employed a James McDonald image of Rua Kenana’s wife Te Akakura Ru, as an example of a ‘type showing Polynesian hair, but Melanesian influence in nose and lips’ – an egregious insult, more so given the anonymity bestowed upon her. In Binney’s book – accurately assessed as a new kind of Māori woman in a changing world – she appears on the cover in striking photogravure glory, revealing a woman of substance and, as his favourite, one of Te Rua’s very best-dressed wives. She stares away from us, hypnotically, dignifying the book’s portal with an iconography every bit as messianic as the favoured portraits of a Christ-like Rua. Power, dignity and wealth are epitomised, as well as the message that both she and her husband – clothed in the very best, and led by the Scriptures – were literate twentieth century citizens, far from the image of the savage, turbulent Tūhoe, cultivated throughout Seddon’s regime. The Premier had promised so much to this iwi in the 1890s, only to have succeeding powerbrokers quickly break his word upon his death in 1906, and in the decades following. In the last two sentences of the paragraph preceding, we see how easy it is to move from analysis into moral judgment, how tempting it can be to set up straw men and condemn the activities of the dead, saving God the job. Judith Binney’s work as gathered here asks us the question: should historians take an overt stand, a moral view of historiography and its role, typified by the work of Edward Said in the postcolonial realm, upon the publication of his seminal polemic Orientalism in 1978? (iv) Said, too, had entered the fray at almost the same historical moment that Binney in the mid-1970s stumbled upon the hidden, decayed world of Rua Kenana’s Maungapōhatu, on a walk through the Urewera with friends. This experience of meeting and speaking with Tūhoe themselves – including expert tribal historians and Maungapōhatu veterans like John Tahuri – radically changed her approach, and the value she put on oral evidence. Ironically, this was not in esence greatly different from the methods of those figures now demoted from the pantheon of history writing: Elsdon Best and James Cowan. The former was at Maungapōhatu eighty years earlier on a similar mission, taking down history by dictation with a specially developed shorthand; the latter had tracked down Māori veterans of the Land Wars, in order to write his journalistic tales of the colonial frontier. Oral history-taking was neither radical nor new amongst Tūhoe: what had changed were the people and Pākehā like Judith Binney and Jeffrey Sissons, who now entered their domain with a solid academic background – and different needs. Which does raise the larger question: were Binney and Sissons better recorders, or just different, children of their times? Best and Cowan were certainly closer to the action: Te Peehi in particular was in Poverty Bay, working, shortly after Te Kooti had been through there on the rampage, and was a contemporary of Rua Kenana, whom he knew and whom he despised as a charlatan and cult leader. The principal difference was that of tertiary education and attitudinal shifts: Best’s generation of Māoriphiles were self taught, at the apogee of a frontier intellectualism that preceeded the establishment of university anthropological studies. Part of the answer to unravelling their closeness to Rua – and our distance – is to take what they saw and sift it with the new skills and opportunties historians have today: not to judge their glaring blind spots, but to receive their labours with humility. The same applies to Judith Binney: her labours have been epochal and groundbreaking. If Tuhoe: the Children of the Mist [v]was Best’s bequest to a people he loved, then these articles, her major works, are Binney’s koha to Tūhoe and to us all. Yet crucially, her principal subjects (the dead Te Kooti and the dead Rua Kenana), both they and their followers, had become akin to the Jews to whom they compared themselves,’people of the Book’. Those whose korero she took down live were inevitably shaped by the writings of the Scriptures, no matter how deeply sycnretic the imported teachings had become in their expression as Māori culture. Binney emphasises the matakite, the visionary elements of her Tūhoe prophets, but had they remained as traditional – and illiterate – tohunga, their authority would have leached away, as had that of traditional nineteenth-century chiefs who had allowed literacy to pass them by. New Māori leaders in the new world were readers. Whether or not those stories that she accessed so vigorously post her 1975 Maungapōhatu epiphany were purely ‘oral’ (i.e. not influenced at all by prior literary productions, including Best’s), and what changes of state occur when the oral is written down as history, then valorised above the written, existing thereafter as it does as writing on the page, is a question we can no longer ask this prodigous researcher, and much-lauded historian – my forerunner in the study of Ngāi Tūhoe and their times. E Pine, e te rangatira, e te pūkenga matua o ēnei kōrero Māori, te kaihautū o te waka nei, e Te Tōmairangi o te Aroha, haere, haere, haere atu rā! (i) Binney, Judith, Encircled Lands: Te Urewera 1820-1921, Wellington: Bridget Williams Books, 2009. (iii) Best, Elsdon, The Maori as he was, Wellington: Government Printer, 1924. (iv) Said, Edward, Orientalism, Vintage (New York: 1979). (v) Best, Elsdon, Tuhoe: Children of the Mist, Wellington: Board of Maori Ethnological Research, 1925. JEFFREY PAPAROA HOLMAN is a poet, fiction writer and lecturer. He has also worked as a sheep-shearer, postman, and psychiatric social worker. He has written several collections of poetry. As big as a father (2002), was long-listed for the Poetry Category of the Montana New Zealand Book Awards 2003 and the title poem also won the 1997 Whitirea Prize.